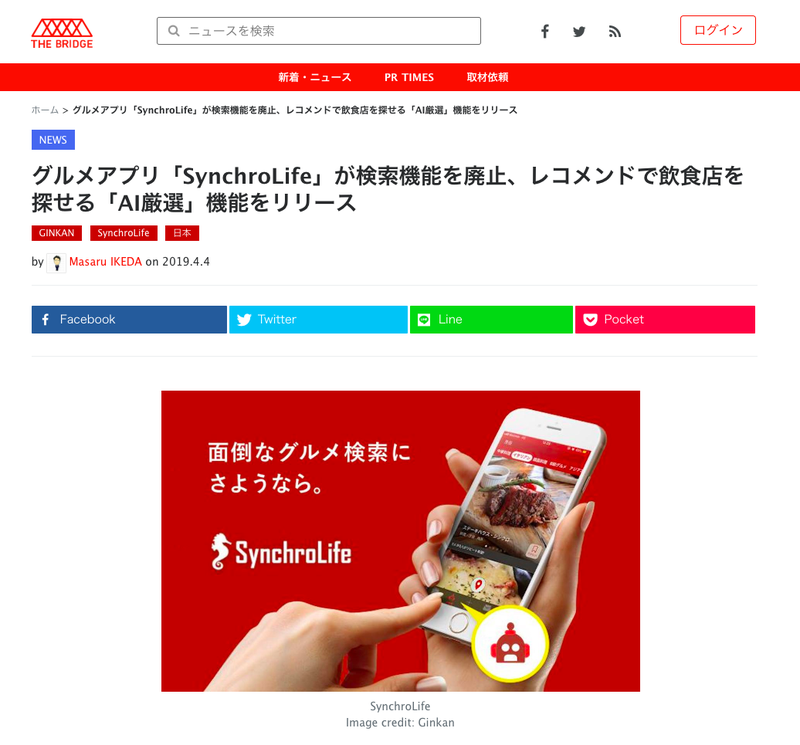 With this big update, Japanese startup and tech news site THE BRIDGE wrote an original article highlighting SynchroLife’s new features and development up until now and we have translated the article into English below for anyone who is interested. Thank you again to THE BRIDGE for featuring this great article about SynchroLife! SynchroLife, restaurant discovery service with an AI based personalization engine, released a major update at the beginning of February disposing of the traditional search feature and replacing it with a “AI Picks” feature. Their update also included a new “For You” personalized timeline that recommends quality restaurants and reviews based on each users daily lifestyle and actions within the app. By using artificial intelligence based recommendations, SynchroLife is half automating the restaurant search process. GINKAN, the management and development company behind SynchroLife, says that by personalizing results, recommending restaurants popular in the SynchroLife social media service, and picking out restaurants that users want to repeat going to, it’s algorithms are able to offer consistently trustworthy recommendations. 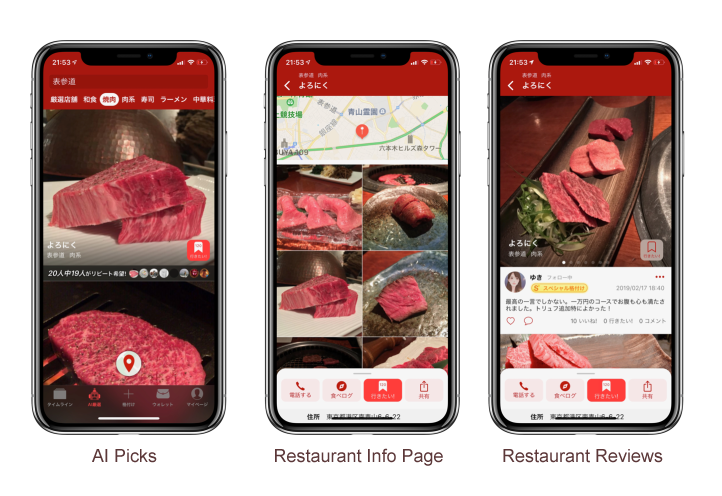 The “AI Picks” feature shows recommendations based on each users’ current location by default, and can be filtered to show results for specific areas and cuisines. Diners can easily find reliable recommendations no matter where they travel for business or pleasure. Since its big renewal in 2017, SynchroLife has added blockchain technology and a “SynchroCoin” based token economy to try and get rid of biased and low quality restaurant reviews. With the latest update SynchroLife has gotten rid of traditional restaurant search features, once again setting them apart from typical restaurant discovery services. SynchroLife is available in Japanese, English, Korean, and Chinese and restaurants can be reviewed in over 155 countries worldwide. The service currently has over 190,000 reviews and approximately 20% of registered users have posted reviews. GINKAN had an angel funding round of 30 million Japanese yen in September 2017, and then raised 80 million Japanese yen in a seed round in August 2018. In summer 2018 they were also chosen for the Plug and Play Japan accelerator program’s Batch 1 and won the “EXPO Winner” award for fintech company at the Plug and Play Japan Batch 1 Demo Day. Thank you again to THE BRIDGE and writer Masaru Ikeda for sharing this article about SynchroLife! We have been covered by THE BRIDGE for other news in the past, you can read translations or the original articles for some of their other coverage below.